Did your child start kindergarten this year? Congratulations! Before long, you will likely be asked to participate in a conference with your child’s teacher. 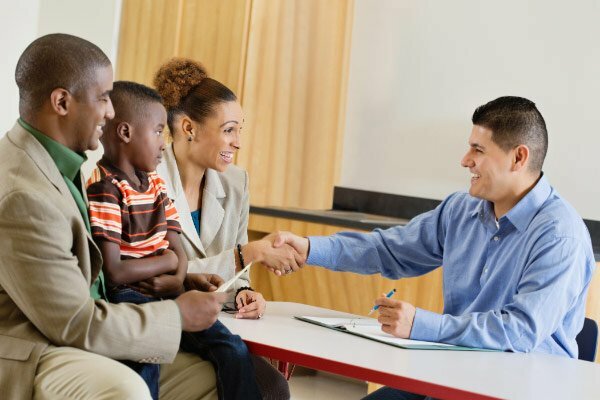 School conferences typically occur in the fall and are a way for parents and teachers to connect. It might even be your first time attending a conference since YOU were a child, so here’s a refresher of some dos and don’ts to help use your meeting time wisely. Check to see what is required of you before the meeting. If you need to bring any completed school forms or student work samples, prepare them in advance. Prepare some questions of your own to keep your time focused. What are some strengths of your child? Where do they need to improve in the classroom? What are some goals for your child in _____ (Example: reading, science or math.). How can you support/enrich your child's classroom work at home? See our must-ask questions for parent teacher conferences. Listen carefully to what the teacher has to say. Take notes to either go over with your child afterward or reference at a later meeting with the teacher. Ask for clarification on any information the teacher shares. Even if you don’t think of the questions during the meeting, follow up with an email or call if there is something you don’t understand. Ask how you can follow up with your child at home to reinforce what the teacher is working on at school. Get specifics about the resources and tools that are available to you. Let your child weigh in beforehand. Talk to your child about the meeting to see if there is anything specific the child would like addressed. Your child might surprise you with something he or she has never mentioned before. Talk to your child about the conference after the meeting. Share the positives, areas for improvement and what can be done at home. It is important to stress the idea of everyone working together. Determine ahead of time if you would like your child present for the meeting. Every teacher has her own style, so review your options. Some teachers require that the child attend or even lead the meeting. No matter what the teacher’s preference, ask for an alternative plan if you are not comfortable. Connect with your school’s parent group. Don’t take away from valuable meeting time by asking about information, such as general policies or volunteering opportunities, that is easily available elsewhere. Arrive late. Most teachers have meetings scheduled very tightly together. If you are running behind, that will cut the amount of time you have with the teacher. Be impatient. If a meeting is running long ahead of yours, know the teacher will either reschedule with you or ensure your meeting gets the full amount of time. Stay quiet! If you simply attend without asking questions or sharing information, your child’s teacher will never know if you understood the main points or have concerns. Go to the principal before you meet with the teacher. If you have worries or ideas, make sure that you address those with the teacher first. If your thoughts are not addressed to your satisfaction by the teacher, then speak to the principal. Exclude your child from the conversation. If your child is present at the meeting, let the child speak for him/herself. Do not answer questions for your child (even if you really want to!). Make this the only time you visit the school. Ask the teacher how you can support your child at school. For example, you could volunteer in the classroom, become a guest speaker, attend the ice cream social or chaperone a field trip. Try to address all topics in one meeting. Remember that there are other opportunities to address other questions you might have. Focus your conference time on the most important ones and not questions about the next class party. Contact the teacher outside the prescribed manner arranged by the school. Most teachers are excellent at returning email, voice messages or notes for questions you might not have addressed at your meeting. Don’t confront them when they’re not expecting you — or send them Facebook messages. Go silent after the conference. Feel free to communicate on a regular basis with the teacher. Teachers truly appreciate communication about upcoming family trips and other situations that might cause classroom disruptions. Most teachers are also open to follow-up conferences, phone calls and emails. Get too emotional. Kindergarten is an exciting — and sometimes scary — time. Don’t take it personally if your child’s teacher has suggestions to improve behavior or academic performance. Remember you’re on the same side. Above all else, remember to keep things in perspective. Teachers are highly trained in their fields and want your child to succeed. A truly successful partnership between parents and teachers requires constant communication and a willingness to collaborate. Kindergarten is the first step in a long journey. Betsy Biederstedt is a retired school principal who balances her time now as the home administrative assistant for her family's many activities. "Kindergarten is the first step in a long journey." Very useful advices. Will surely make a note of each and every advice and put them in action.